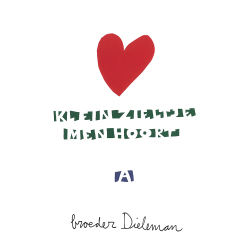 We are very happy to release both Broeder Dieleman's debutalbum 'Alles is ijdelheid', and his new EP 'Klein Zieltje'. His songs about the mystical landscapes of his home, Zeeland, have filled our office many times over the last year, so it feels more than right to have broeder Dieleman join our family. On the EP that will be released on vinyl on October 12, broeder Dieleman digs deeper into his roots. Side A holds two songs that have been recorded for the radioshow 'Onder de Groene Linde' in the 60s in Zeeuws Vlaanderen. Side B has 'Land van Verandering', coming from the soundtrack broeder Dieleman made with Pim van de Werken for the documentary with the same title about West Zeeuws-Vlaanderen and its people.